Do you hate attending networking events? Do you hide at the back of the room when you have the opportunity to present your business? Are you uncomfortable approaching people you don′t know? Does the thought of speaking in public fill you with dread? If so, then you share anxieties in common with almost everyone who has ever worked and had to present themselves in a formal setting. In 1984 a New York Times Survey on Social Anxiety placed death third in the list of people′s biggest fears. The top two responses were walking into a room full of strangers and speaking in public. Winning Presentation In A Day will help you overcome your fears and deliver a powerful message, every time. Understanding how to give a winning presentation is an absolute necessity in today′s world. Sooner or later, everyone has to give a presentation, whether at work (a sales call, a briefing to the boss, participating in a seminar) or in personal life (a class report, speaking at a community organization). Yet the idea of getting up in front of others is absolutely terrifying for many people. This handy guide shows readers how to overcome their fear and create a great presentation quickly and easily. 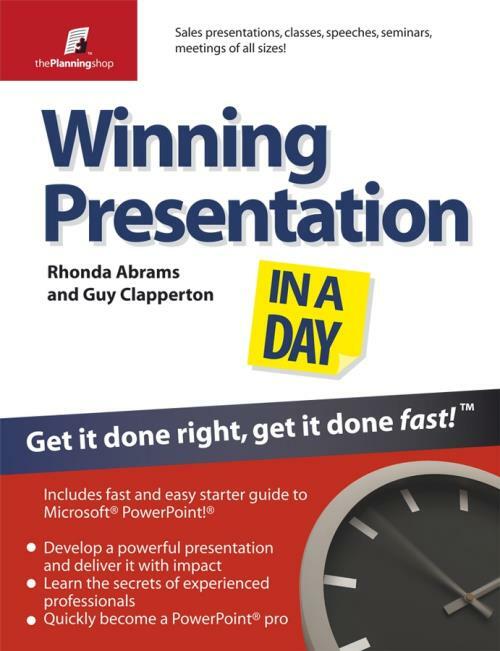 This book covers all the most important aspects of developing and delivering a successful presentation, including content; organizing an effective message; delivery techniques, including pacing, humour, statistics, and storytelling; handouts, graphs, charts, and other tools; managing the Q&A; making a good impression; and conquering stage fright. Also included are equipment tips and techniques for videoconferences and teleconferences. At the Planning Shop, we have one goal: helping you develop a successful business plan for a successful business. Our mission is to be the number one provider of business planning resources for the serious entrepreneur. Our books and products are based on years of real–world experience, sharing insight and advice­–secrets and strategies–from entrepreneurs, funding sources, CEOs, strategic partners and more–with our readers. In the US, hundreds of thousands of entrepreneurs have used The Successful Business Plan to develop their business plans. It′s widely adopted by business schools; tens of thousands of MBA students have used it to create business plans and to enter business plan competitions. Entrepreneurs throughout the world have turned to The Successful Business Plan to guide their business development. USAID programs (United States Agency for International Development) adopted it to assist novice entrepreneurs emerging from Communist rule; entrepreneurs and students in places as far apart as Thailand, Ghana, Greece, Uruguay and even Afghanistan use it. Guy Clapperton is the UK adapting author for this book and is a highly experienced freelance journalist, editor and broadcaster specialising in business and technology issues. Guy has extensive experience with a range of newspapers, including Editorial Associate, podcaster and columnist for the Guardian s regular Business Sense section for over eight years. He has also contributed to FT s Business Life pages, the Mail on Sunday, the Observer s Cash section, as well as the Independent, Daily Mirror, the londonpaper, Evening Standard and the Daily Express. Online Guy has contributed to Reuters.com and been a blogger for Smallbizpod. Guy has done radio and broadcasting work for BBC London Radio Breakfast Show, BBC World Service "Digital Planet", Woman′s Hour, Sky Television and the Open University. Guy has authored or edited a number of books and also offers media training.